Boys and girls, young and old alike will love these fine reprints from the early 1900's! See what it was like to keep yourself busy with the projects of yesteryear! NOTE: OUT OF PRINT-THEY'RE ALL GONE FOR NOW. "1000 things for Boys to Do." Do plane-table surveying and make accurate maps. Make a four-passenger bobsled, and ice glider, snowshoes, snowball thrower, paddlewheel boat, tandem monoplane glider, movie camera and projector, laboratory gas generator, soap box racer, oil burner for cook stove, combination lock for a drawer, magic tricks, electric score board, disc-armature motor, and hundreds of other things. This third volume seems to be somewhat more outdoors oriented than the first two volumes. You get ideas on building a coasting toboggan, sail driven ice boat, instructions on skiing, casting for game fish, on building a canoe, a house boat, a portable fishing boat, tricks of camping out and much more. You'll find great ideas on building a boy's homemade motor car, mission furniture, a searchlight, a dragon kite, a model mono-plane, a circular swing, a merry-go-round, a aerial cableway, a miniature fighting tank, a machine gun, a small working pile driver,homemade electric model train set, plans for a variety of photographic equipment,a miniature illuminating gas plant, a hydraulic turbine, and much, much more. We Have Harpers Electricity book For Boys Too! You may remember having read "The Boy Electrician" when you were a kid. If not, you missed something. You get practical how-to plans and advice to build and have fun with all kinds of electrical equipment. You get a boy's classic book. Books like these aren't published anymore. This is worth having. Lots of great experiments, ideas, and teasers to get the imagination going. "Practical Plans for Work and Play with Many Ideas for Earning Money. With nearly six hundred illustrations and working-drawings..."
Neat books for boys... and for old men who dream of being a boy again... This is about snow castles, soap box racers, a home workshop and much more. And beautifully illustrated with drawings and photographs. 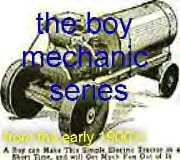 Chapters include the home workshop, tools and home-made shop equipment, elementary manual training, wood finishing, working-drawings, easily made furniture, handy contrivances for the house, a boy's room in an attic, box and barrel furniture, cigar-box toys and gifts, clockwork toys, brass craft, a boy's wireless telegraph outfit, stunts for a boys' vaudeville show, moving pictures, a snow battleship, a coaster and a bob-sled, model aeroplanes, a boy's auto-airship, camping equipment, a home-made punt (boat), a home-made sharpie (boat), pushmobiles and other home-made wagons, bird-houses, houses for pets, a castle club-house and home-made armor, and a boy's band of home-made instruments. I'd like to meet any kid who even tried to build half the projects since this book was first published in 1911. This is loaded with great ideas but you'll have to modify some of the plans. Where are you going to get old-time cigar boxes, or wooden barrels, or clockworks? But this is a plans book. And a mere skim through the pages was all that it took to convince me that it was worth reprinting. I think you'll agree. It's a bit expensive, but it's a big book and a short press run t'aint cheap. Get one. It'll fill your brain with ideas, or memories. Great gift. (especially for yourself...) 5-1/2 x 8-1/2 softcover 437 pages.